In today's vignette, let's react once again to search engine key words that have led recent visitors to my blog. Law firm cross selling is a search term that quite frequently appears in my search logs. Most lawyers perceive cross selling as the other guy's job. "I told them what I do, now it's their responsibility to introduce me to their clients." This is a waste of time, whether due to apathy, or busy schedules, or -- in large firms in particular -- the inability to really know what everyone else does. So many firms, or the firm's marketing team, create elaborate Intranet sites and internal newsletters where success stories are published and deal lists and practice descriptions are housed, so that each lawyer may spend time perusing his or her colleagues' area of specialty. But no one really does this. Let's assume for a moment that there is no financial disincentive, such as a compensation system that rewards isolationist behavior or at least fails to reward collaboration. These systems exist, but like wallpaper they're a big pain in the neck to remove and replace, so they remain. Why, then, do so many lawyers fail to go out of their way to cross sell? First, many lawyers are bad at math. 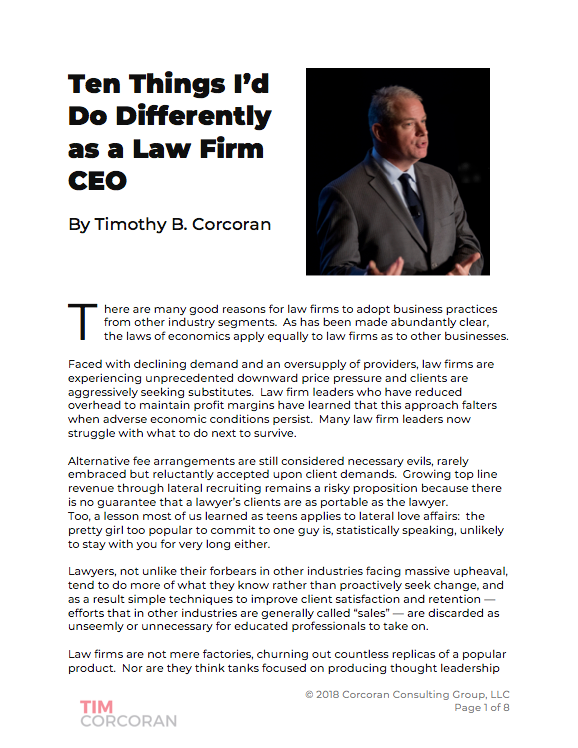 If every lawyer is more fully utilized, and we're doing more work with existing clients (or, in other words, our cost to acquire new work is lower than it would be to seek new clients) then the firm overall will be more profitable and all shareholders will benefit. Instead, many tend to focus on their personal performance and origination. Secondly, many lawyers fail to recognize that cross selling is MY job. If I want my colleagues to recommend me to their clients, then they need to know what specific problems I solve, and what specific triggers or flags should lead to an introduction. Vaguely advertising that I do real estate work is less specific than educating my colleagues that, for example, any client with distressed assets in need of protection or disposal, or clients conducting an acquisition that includes real assets with unknown liabilities, should speak to me. It's incumbent on each of us to educate our colleagues about the top two or three problems we solve, and how to identify one of these problems in the making. Yes, yes, I know that if we limit it to two or three problems, then we'll be completely overlooked by our colleagues when a separate but equally lucrative issue comes along, and since we didn't identify it they'll recommend that their client seek another law firm with more relevant experience to handle it. Or so we think. Have you ever gone to a steakhouse with a vegetarian? She doesn't starve! Or to a seafood restaurant and ordered a steak? Just because we promote one or two or three compelling ideas doesn't mean we can't or won't provide services outside this range. So narrow it down, make it easy, and trust your colleagues to know you also do other work in this field. Finally, cross selling requires familiarity and trust. We've heard the maxim that clients buy from people they like and trust. This applies within a law firm too. So make time to get to know your colleagues. I've been in law firm practice group meetings where two partners had never met in person, yet they practiced in the same group for a couple years, and presumably attended the same annual practice group offsite meetings, but their schedules had never really coincided. In today's growing law firm, it's hard to get to know everybody. But try. Work from another office periodically. Pick two or three colleagues you don't know, even if your clients have never had a need in this area, and take them to lunch this year. When traveling to a client site, if there's a satellite office nearby, drop in and walk the halls. Your colleagues will refer business to you when they trust you, and they won't generally trust you until they know you. This is also why every law firm retreat I'm asked to organize includes some pub time, or golf time, or spa time. This is sometimes eliminated due to cost or optics, but in fact it's critical to spend time off the clock with your colleagues. Work the room, get to know people. You'll be amazed how frequently your name will come up in their client meetings when they know you, know what problems you solve, and how to spot the issues when they arise.